Frank Darabont, is a Hungarian-American film director, screenwriter and producer who has been nominated for three Academy Awards and a Golden Globe. He has directed the films The Shawshank Redemption, The Green Mile, and The Mist, all based on stories by Stephen King. In 2010 he developed and executive produced the AMC network television series The Walking Dead. Darabont was born in a refugee camp in 1959 in Montbéliard, Doubs, France. His parents fled Hungary after the 1956 Hungarian Revolution. When he was still an infant, his family moved to the United States, settling in Chicago. When Darabont was five the family moved to Los Angeles. By the age of 20, Darabont became involved in filmmaking. One of his first films was a short adaptation of Stephen King's The Woman in the Room, which made the semi-finalist list for Academy Award consideration in 1983, and was shown in its entirety in the 1986 syndicated television special, Stephen King's World of Horror. The short, a "Dollar Baby", led to a close association with King, who granted him the "handshake deal" rights to another one of his shorter works, Rita Hayworth and Shawshank Redemption from the collection Different Seasons. Prior to his directing career, Darabont was a successful screenwriter with work on genre films that included: A Nightmare on Elm Street 3: Dream Warriors, The Blob, The Fly II and an unproduced sequel to Commando. Darabont made his feature length directorial debut with Buried Alive, a TV movie with a $2,000,000 budget that aired on the USA Network in 1990. Darabont followed with an extended run as writer for George Lucas's short-lived television series The Young Indiana Jones Chronicles. Darabont became famous after making good on the deal with Stephen King by writing and directing The Shawshank Redemption, for which he was nominated for a Best Adapted Screenplay at the 1995 Academy Awards. The film was also nominated for six other Academy Awards including Best Picture. After a five-year hiatus, Darabont returned to the screen with the well-received The Green Mile, a film he directed, scripted and produced. Like The Shawshank Redemption, this film is also based on a Stephen King work. The film was nominated for the Oscar for Best Picture and Darabont was nominated for his second Academy Award for Best Adapted Screenplay. He followed this with The Majestic two years later in 2001 to considerably less fanfare. Following lukewarm reviews from critics, the film failed at the box-office, recouping only half of its $72 million budget internationally. Darabont is known to have been a script doctor for Steven Spielberg films such as Saving Private Ryan. In 2002, he penned an early draft of Indiana Jones and the Kingdom of the Crystal Skull; while Spielberg reportedly loved it, George Lucas rejected it. In 2005, Cemetery Dance Publications published Darabont's novella Walpuski's Typewriter in a limited edition. The story, originally written in his early twenties, first appeared in Jessie Horsting's magazine Midnight Graffiti. 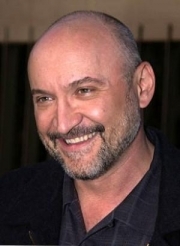 Darabont appeared in "First Class Jerk", the October 26, 2008, episode of Entourage in which he propositions Vincent Chase to star in a TV show he is executive producing. He appeared in a September 12, 2009, episode where he is now the director of the film about Enzo Ferrari, who Vince is portraying. According to the Battlestar Galactica: The Official Companion series by Titan Books, Darabont—a huge fan of the re-imagined series—was slated to direct "Islanded in a Stream of Stars", the penultimate episode of the show's final season. Due to scheduling conflicts, he was unable to take the job, which fell to series star Edward James Olmos. Darabont executive-produced the first season of The Walking Dead, the AMC series based on Robert Kirkman's comic book of the same name, having written and directed the pilot. The series features a number of Darabont regulars, including Jeffrey DeMunn and Laurie Holden. In July 2011, Darabont stepped down from his position as showrunner for the series. Initial reports suggested that he was unable to adjust to the schedule of running a television series, however it was later confirmed that he was fired due to the show's reduced budget and his strained relationship with the executives of AMC. Whole or part of the information contained in this card come from the Wikipedia article "Frank Darabont", licensed under CC-BY-SA full list of contributors here.